it does not affect the presentation of the content. There is growing demand from the public for health care and prevention following the change of social economic environment and population structure. Therefore, health care administration faces multiple new challenges. In particular, international communities of health care and prevention have been gradually advocating more natural therapies in recent years. Chinese medicine administration is becoming progressively important. We promote the quality of physicians and related services as well as the development of Chinese medicine health care facilities in tandem, so as to increase the quality of Chinese medicine health care. China Medical University established the school of Chinese medicine in 1966. Since then, Taiwan has had 5 schools of Chinese medicine at 4 universities: the school of Chinese Medicine for bachelor degrees at China Medical University and Chang-Gung University; the school of Chinese Medicine for post- baccalaureate degrees in China Medical University, I-Shou University and Tzu- Chi University. Annually 365 modern Chinese medicine physicians are educated and trained to receive both western and Chinese medical knowledge. Table 2-1 roughly shows the duration and admission number of Chinese medicine education in each institution. There were two categories of national examinations for obtaining the qualification of Chinese medicine physician before 2011. The first was an advanced examination for physicians of Chinese medicine to obtain the acknowledgment by passing a professional and technical examination, and special examination for physicians of Chinese medicine to achieve a professional and technical examination. Candidates that completed a bachelor degree in Chinese medicine, or a qualified Western medicine physician who had completed a related Chinese medicine degree could be eligible for taking a senior examination for becoming a Chinese medicine physician. The special examination for Chinese medicine physicians was provided for people who self-studied or studied in non-professional tutorial schools and had passed a certifying examination in Chinese medicine. However, these people did not have fully modernized Chinese medicine training. In order to increase the quality of Chinese medicine physicians and ensure that professional training, teaching, testing, has been received by physicians, Article 3 in the Physicians Act was amended on 16 January, 2002. The examination system for Chinese medicine physicians would only be available through a university education. This meant that after 2011 people could only apply for the Chinese medicine physician examination after completing a university education. The special examination for Chinese medicine physicians was then officially terminated. Amendments of this policy were a positive step towards improving the quality of Chinese medicine physicians. The first phase: “Chinese Medicine Clinical Teaching System Plan” has been promoted during 2002-2008. Training teachers, locating facilities, establishment of the training models, developing plans, compiling educational materials, implementing of training and other fundamental works were completed gradually, to enrich teaching institutions software and hardware equipment and resources. The second phase: “The Responsible Physicians in Chinese Medical Training Program and System” has been promoted since 2009 until now. The Ministry has appointed qualified training facilities and advised these facilities in order to enhance both the fundamental programs for in-coming Chinese medicine physicians and their clinical competence in Chinese Internal Medicine, Gynecology, Pediatrics, Acupuncture and Traumatology. And they can choose to receive general Western medicine and emergency training. “The Training System of Responsible Physicians in Chinese Medical Care Institutions” has been officially implemented in 2014. Now Chinese medicine physicians who would like to be responsible for Chinese medicine facilities must have two-year physician training in the training institute appointed by the Ministry, to cultivate Chinese medicine physicians with comprehensive medical skills. According to Item 2, Article 8 in the Physicians Act, Chinese medicine physicians should attend continuing education during practice. Also practice license renewal requires the certification of completed continuing education every 6 years. The Ministry announced “A plan for improving the practice quality of Chinese medicine workers” in order to carry out this policy effectively and Chinese medicine organizations are subsidized to conduct continuing education activities each year. A total of 50 professional continuing education seminars were conducted during 2012-2017. A total of 5,595 Chinese medicine physicians participated in the activities. Figure 2-2 shows the snapshots of an activity. According to article 24.1.4 of the Nursing Personnel Act, nursing personnel can perform Chinese medical assistance activities. Universities and colleges with department of nursing have been encouraged to open a Chinese medicine nursing curriculum. The Ministry sets the “Guidelines of Elective Subjects and Credits for Chinese Medicine Nursing Training” in 2000 (there are 7 subjects and 9 credits; including general knowledge of Chinese medicine, general knowledge of Chinese pharmacy, Chinese medicine cuisine, acupuncture nursing, trauma nursing, Chinese medicine nursing and practical training of Chinese medicine nursing). Nursing organizations are subsidized to conduct Chinese medicine nursing training each year. A total of 2,572 nurses have completed 7 subjects & 9 credits training programs up to the end of 2017. Figure 2-3 shows a snapshot of the training. To build a patient-centered, safe, and good-quality Chinese medicine health care system, the Ministry stipulated the hospital accreditation standards in 2004 to implement the “Chinese medicine Hospital & Hospital Chinese medicine Outpatient Department Accreditation”. The accreditation standards include 2 sections: Operational Management and Medical Care, consisting of 196 items. In the end of 2017, 4 such accreditations have been organized, and there are currently 4 accredited hospitals. Please refer to Figure 2-4 for the number of accredited hospitals over the years. Teaching hospital Chinese medicine outpatient department has been included in the teaching hospital accreditation since 2011. The Chinese medicine accreditation items include Section 5.7 (Intern Chinese medicine Student Training Program Implementation and Outcome), which consists of 7 articles. Section 5.8 (New Chinese medicine Physician Training Program Implementation and Outcome) contains 7 articles. If the hospital wishes to accept final year intern Chinese medicine students, they must pass Section 5.7 and Section 5.8 accreditation; if the hospital wishes to recruit new Chinese medicine physicians, they must pass Section 5.8 accreditation. 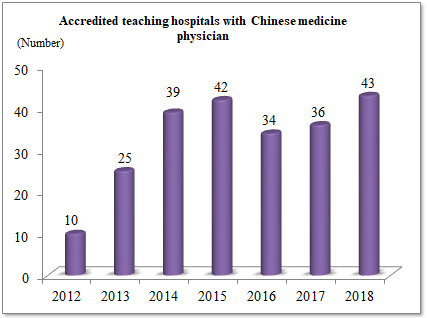 There are currently 43 teaching hospitals with accredited Chinese medicine physician posts; please refer to Figure 2-5 for the number of accredited hospitals. Hospitals with a Chinese medicine department will officially enter into “Hospital and Teaching Hospital Accreditation” in 2015. Any Chinese medicine department with more than 4 Chinese medicine physicians must be accredited. There are 3 accreditation items for community hospitals or regional hospitals: Chinese medicine and cross-team medical care, comprehensive facilities and patient safety measures. For medical centers, an additional item involves Chinese medicine human resources allocation and training; all 4 trial accreditation items are not included in the assessment of accreditation results. In order to allow hospitals that have more than 4 full time Chinese medicine physicians but do not yet qualify for the teaching hospital accreditation to be used as the Ministry’s “Training Plan of Responsible Physicians in Chinese Medical Care Institutions”, the Ministry will continue to conduct TCM hospital accreditation. In 2018, the accreditation standards are adjusted into 3 major sections: management, medical care and teaching training, totaling 17 chapters and 84 items. The validity period is until December 31, 2022. In order to select high quality and sound Chinese medicine clinics as the training venues for Responsible Chinese medicine physicians, the Ministry has stipulated the selection criteria for main training clinics and organized the selection process since 2017. The selection criteria includes two articles of management and medical care, and a total of 16 articles are selected to determine qualified institutions. Accredited clinics will be able to apply for the Ministry’s “The Training Program of Responsible Physicians in Chinese Medical Care Institutions” for a valid period of 5 years. In 2017, there were 28 accredited medical care clinics with valid period from January 1, 2018 to December 31, 2022. The Ministry encourages general hospitals to set up departments of Chinese medicine in order to provide Western medicine and Chinese medicine in parallel toward public health care and prevention. Also, setting up a department of Chinese medicine will promote the integrated development of Western medicine and Chinese medicine. 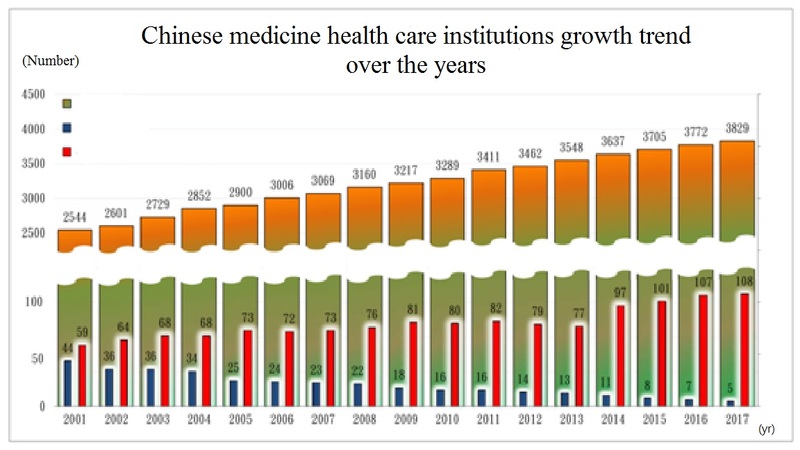 The number of Chinese medicine institutions has been gradually growing in the past ten years. There are a total of 3,834 Chinese medicine institutions, including 5 Chinese medicine hospitals, 3,829 Chinese medicine clinics and 108 hospitals with a department of Chinese medicine in Taiwan up to the end of 2017. Currently, NHI covers only the Chinese medicine outpatients, whereas Chinese medicine inpatients are not covered. Therefore, the number of Chinese medicine hospitals decreased from 44 hospitals in 2001 to 5 hospitals in 2017; meanwhile, the number of Chinese medicine clinics increased each year from 2,544 clinics in 2001 to 3,829 clinics in 2017. 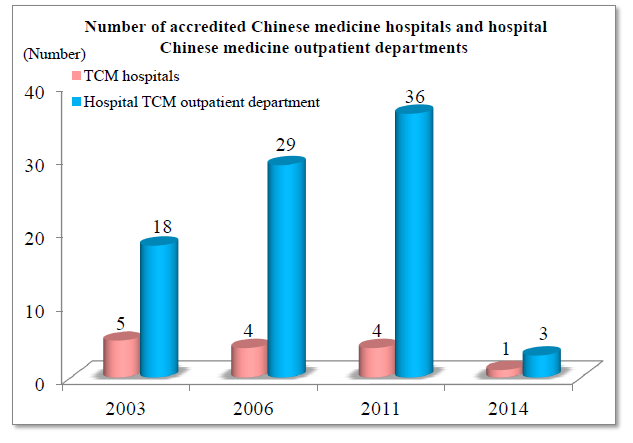 The number of hospitals with a Chinese medicine department also increased from 59 hospitals in 2001 to 108 hospitals in 2017, as shown in Figure 2-6. Western/Chinese medicine combined care model: Eight Western/ Chinese medicine combined care models are established in the outpatient department, emergency rooms, and wards (treatment of head and neck tumor, vertigo emergency, pain emergency, chronic wound, reflux esophagitis, precocious puberty, atopic dermatitis and bowel obstruction). In particular, emergency treatment of vertigo, pain and bowel obstruction will be incorporated into the NHI trial plan in 2018. Chinese medicine day care model: Chinese medicine day care model has been established for 11 illnesses (pediatric asthma, endometriosis/dysmenorrhea, stroke sequelae, dementia, chronic kidney disease, diabetic kidney disease, esophageal cancer, breast cancer, colorectal cancer, bladder cancer and sports injury/lower back pain). 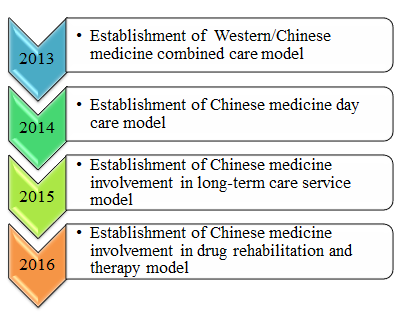 Chinese medicine involvement in long-term care service model: Chinese medicine involvement in long-term care service model has been established for 2 different settings (nursing home and retirement home). Chinese medicine involvement in drug rehabilitation and therapy model: TCM involvement in drug rehabilitation and therapy model has been established for 2 applications (auriculotherapy and laser acupuncture).